Switzerland. It’s smaller than Tasmania, but rather more famous and never missing from maps of Europe. Cheese and chocolates, pocket knives and swatches. Banks replete with hot money and the global puppeteers of the World Economic Forums at Davos. Everybody has an image of this tiny little country of just 7.5 million people in the center of Europe. But the image may be vastly different from the reality with fame inevitably viewed through a pale ale, darkly. Recently Switzerland has been in the news for joining the lemmings massing to jump the nuclear ship in the wake of the failures at Fukushima. What will this do to the Swiss greenhouse gas footprint? What is that footprint? The greenhouse gas emissions per person in Switzerland are well under a third of those of an Australian. That’s 7 tonnes per year compared with 25. This 7 tonnes per year is still 7 times bigger than the 1 tonne budget which following generations will inherit and be required to meet before today’s toddlers are getting a pension, but it’s still remarkably low compared to our bloated Aussie hoof print. How is such a low footprint possible? Is there a simple explanation? Is it because the Swiss are parsimonious misers who build bicycles from recycled bottle tops or drive tiny efficient matchbox cars while Australians BBQ gross steaks in front of monster screen TVs and drive gas guzzling 4WDs vast distances across our great brown land? And what are the long term (30 year) prospects of the Swiss getting down to that magic 1 tonne sustainable emissions limit? Be prepared for a few surprises. [Unless otherwise noted, the data below comes from either the Swiss 5th Communication (pdf) to the UNFCCC or the 2008 Australian Greenhouse Accounts (released in May 2010) (10MB Zipped PDFs)]. Swiss winters look stunning on postcards but would quickly kill anybody living in houses as thermally leaky as most in Australia. Consequently, heating oil is about 21 percent of Swiss energy consumption and you’d expect housing construction emissions to be higher. There is a cost to double glazing and roofs that don’t collapse under a metre or two of snow. Nevertheless, per person energy use in Switzerland is just over half what it is in Australia, and more of what they do use is electricity (23% to our 16%). Swiss electricity is virtually all emission free, as we shall see. Despite its tiny carbon footprint relative to places like Australia and the US, the the Swiss targeted heating oil with a BIG NEW TAX back in 2000 with the aim of reducing its use to 15 percent below 1990 levels over the 2008-2012 period. The tax takes the form of a levy where initially the full amount, but now 2/3, of the money raised is returned to the population and the rest goes toward research and development projects. The levy automatically rises if emissions don’t fall and currently stands at 36 CHF (Swiss Francs) ($A43) per tonne of CO2 and is expected to hit 110 CHF to achieve the longer term 2020 goals. Judging from the emissions graphs, the reductions look to be reasonably well on track thanks also to some BIG NEW RED TAPE in the form of stringent efficiency requirements on buildings. A decrease in the amount of cold weather has also been rather helpful. However it seems that more efficient buildings have had a down side … people just build them bigger. This means that the space per person which needs heating has gone up. This pretty much parallels what has happened as computer screens become more energy efficient … people just get bigger screens and more screens. Note that almost any major legislative decisions made by the Federal Government in Switzerland must be passed by the people. They vote about 4 times a year with perhaps a dozen proposals each time. So the Swiss people are firmly behind greenhouse emission reductions, despite the extra taxes and building regulations. The comparison with Australia couldn’t be more stark. We are comparing people attempting to do the right thing with a country where ignorance has been elevated from something formerly practiced between consenting adults at BBQs to something about which a seemingly growing number of people are loud and proud. But sometimes the good intentions of good citizens are not enough. Unlike the heating oil measures, the less stringent transport fuel targets (8% below 1990 during 2008-2012), are failing. The main policy instrument is another BIG NEW TAX, a heavy vehicle fee to encourage a shift from road to rail. A shift has indeed been achieved, as have efficiencies in road freight, but emissions are rising due to increasing numbers of private motor vehicles. Australia has about 72 cars per 100 people while Switzerland has only 52 but with a ratio rising fast enough to swamp any efficiency gains from the available measures. I gave Switzerland a glowing report card on its cycling policies in a recent piece on “The Punch”, but the pro-cycling, pro-rail policies haven’t come close to compensating for the rise in motor vehicles and their use. Here’s where the cultural identity formed by “The Tyranny of Distance” and our wide brown land starts to sabotage our intuition. It’s hard for an Australian to understand how anybody can rack up a decent tally of motor vehicle emissions in a country smaller than Tasmania. Put the pedal to the metal and you’re across one or more borders before your foot stops. So … time for a quick quiz … who does more kilometers per person per year in their motor cars? Both countries have competent statistical bureaus which measure such things. Dividing passenger kilometers in private motor vehicles by the population reveals that the Swiss do about 35 kilometers per person in motor cars every day. Australians only manage about 28! On the other hand, the cars really are smaller and more fuel efficient so the Swiss personal transport emissions are about 1.5 tonnes per person compared to 1.9 tonnes per Australian. Expecting bicycles to slash transport emissions is rather like expecting solar panels to slash energy emissions. There seem to me to be two choices to steeply reduce transport emissions. Either implement some seriously draconian anti-car measures, or generate clean electricity and electrify both cars and their construction. Current pro-bicycle, pro-rail policies in Switzerland have been wildly successful from a PR and public health perspective, but haven’t even stopped emissions growing, let alone achieved the necessary steep reductions. While Australia generates its electricity at the cost of about 200 million tonnes of CO2 from some of the dirtiest power plants on the planet, the Swiss get almost all their electricity with virtually no greenhouse gas emissions. Their biggest electricity source is a wondrous system of high dams and raging mountain rivers which drive a bevy of hydro schemes generating 56 percent of their electricity. Signs in 5 languages with scary little graphics line many a Swiss mountain stream warning you that the upstream hydro plant can release water and wash you away without warning. In addition to hydro power, there are 5 nuclear power plants generating another 40 percent. It is these that the Swiss now want to close down over the next 20 years. The other 5 percent of electricity comes from various high profile, low-yield energy, high-yield photo opportunity renewable systems. Mainly waste incineration, but also boutique projects like the long line of photovoltaic panels lining the road into Chur, near Davos. Locals were ashamed when panels went walk-about (slang) after the system was first installed. Most of the nuclear power stations began operation in the seventies with the latest and largest coming on line in 1984. So how much of the massive difference have we explained? Emission free electricity certainly helps, but we haven’t really explained how they get by using so little energy. UNFCCC submissions aren’t well suited to answering this question, but a break down of energy use by sector from the IEA gives a rough answer. The yellow sector is residential use, services and agriculture. The blue sector is industry. In Switzerland that sector hasn’t increased its energy usage for 50 years. Swiss have plenty of metallurgical engineering expertise, but there are no monstrous machines digging open cut mines and rail trucks full of coal, iron ore and bauxite. While there is aluminium recycling, the Swiss submission to the UNFCCC list no primary production. Australia, by comparison, produces 20 million tonnes of alumina after digging up 70 million tonnes of bauxite. Much of the alumina is exported for someone else to add value to, but we use some of it to produce about 2 million tonnes of aluminium with some of the filthiest (high CO2 producing) production chains on the planet. In essence, the Swiss may use steel, aluminium and other products of heavy industry, but they come from elsewhere. The Swiss submission to UNFCCC cites a study estimating that Swiss emissions would be two thirds higher (about 11.5 tonnes per person) if the emissions from imports were attributed to Switzerland. So the Swiss lesson is broadly that if have emission free electricity, offshore your heavy industry emissions and drive smaller cars you can reduce your emissions down to about 7 times the long term sustainable global goal of 1 tonne per capita. But what about food? Since Switzerland is famous for chocolate, you’d expect them to have more than a few cows … and they have. So let’s have a quick look at how the agriculture sector works. Cattle in Australia generate vastly more greenhouse gases than our aluminium production chains (see note 1 for details). But, although the Swiss export chocolate globally, they don’t really have that many cattle. The ratio of cattle to people in Switzerland is just 0.2 compared to 1.2 in Australia. In total, agriculture in Switzerland is about 10 percent of greenhouse gas emissions with the biggest source being those 1.57 million cattle that generate milk, meat and methane (see note 2). The cattle population has fallen from 1.86 million in 1990 and meat consumption is also down about 10 percent and now stands at about 60 percent of Australian levels. Consequently, bowel cancer is about two thirds of the Australian (age standardised) rate, but still amounts to 4700 new cases each year, about 10 percent of all new cancers. With a high proportion of dairy cows in the herd generating the substrate of that famous chocolate, there is an abundant surplus of unwanted calves. They end up as sausages … bratwurst. This is precisely the kind of meat that the World Cancer Research Fund tells people not just to reduce, but to avoid altogether. Per gram, it is about 3 times more potent as a cause of cancer (bowel certainly, with other cancers likely) than ordinary red meat. I don’t have Swiss data, but Australian Cancer Council epidemiologists calculate that about half of our bowel cancer is attributable to red meat. So how does a couple of thousand new bowel cancer cases each and every year in the tiny Swiss population compare with the toll from the Chernobyl disaster over 25 years in a vast exposed population? According to the WHO, it’s about 5000 cases of childhood leukemia over 25 years with a 99 percent successful treatment rate and a further 40 or so cancers in adults per year (see here and here for details). Apart from the childhood leukemia, the figures are calculated based on theoretical modeling because the impact is far too small to be seen in any noticable blip in the background cancer rates caused by such things as cigarettes, red and processed meat, alcohol, obesity, unlucky inheritance, inactivity and, particularly in Switzerland, bratwurst. But the Swiss are now frightened of nuclear power while still queuing up at bratwurst street stalls. Part of the problem is that even though European data was central to many World Cancer Research Fund considerations, its 2007 Expert report was only published in English. Nobody I spoke to on my recent visit to Switzerland had even the slightest clue that either red or processed meat cause bowel cancer … but they all knew about the “horrors” of radiation. Despite the relatively small number of cattle by Australian standards, they do dictate many other aspects of food and agriculture in Switzerland. I’ve already mentioned bratwurst. In addition, the mown green alpine fields so beloved by tourists aren’t mown for them, but for the cattle. Large areas of arable land that could be producing food are instead producing hay to feed the cattle over winter. Barn architecture, also much beloved by tourists, is also driven by the need to store mountains of hay over winter. The Swiss, of course, can choose to produce hay instead of food because they can easily outbid poor countries for cereals on the world market. There is of course, more to feeding a country than chocolate and bratwurst. Cycle just half an hour from any point in any Swiss city in pretty much any direction and you will find crop fields, pastures and barns. At both first and second glance, there is a cornucopia of food. But the statistics reveal a slightly different story. Switzerland isn’t even remotely close to self-sufficient. It imports about half its cereals and about 20 percent of its meat. 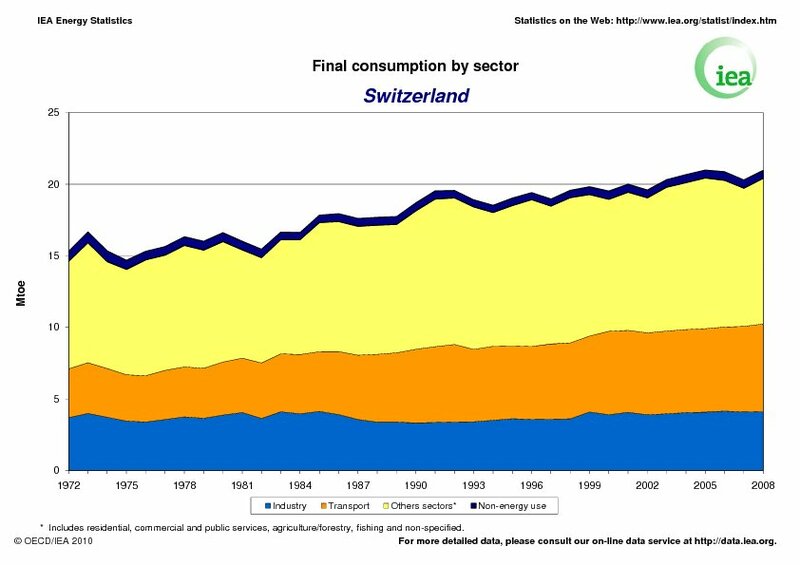 Switzerland is a wonderful lesson in what can be achieved with a diligent well meaning population with access to emission free electricity and where industrial emissions have been largely outsourced. Instead of modest cuts to heating oil, the Swiss will need to entirely electrify heating. They need more nukes, not less. Instead of failing to curb rising transport fuel use, the Swiss will need to entirely electrify motor vehicles and source them from countries who have electrified their construction. This needs more nukes, not less. Nuclear power is the Swiss army knife of the energy business. And if the Swiss are really worried about cancer, then there is no shortage of high yield prevention measures that they could be taking, instead of flinching at nuclear shadows. Our latest UNFCCC gives a figure for emissions from aluminium production of 3.4 megatonnes CO2eq (p.165). The same documents gives a figure of 54.7 megatonnes of CO2eq for enteric fermentation (mainly burps, mainly from ruminants). The breakdown by species is given in theCRF documents indicates that 76 percent of this is cattle … 41.5 megatonnes CO2eq. The way data is aggregated for UNFCCC reports is designed to be easily standardised and reproducible. It isn’t designed to actually capture the true emissions associated with an activity. The aluminium industry, and everybody else, realises this. The true emissions associated with aluminium production include the emissions associated with the electricity source. Including these indirect emissions puts the emissions associated with alumina and aluminium production closer to 30 megatonnes. Beef still easily out pollutes aluminium production. In addition the enteric fermentation is methane and the UNFCCC rules calculate the impact of this over a very long time frame. The real world warming, used in all climate models, is over 3 times higher. But, by analogy, beef production emissions include a raft of indirect emissions which are not allocated to beef on UNFCCC submissions. According to their respective submissions to the UNFCCC Swiss agriculture produces 10 percent of national emissions compared with 14 percent for Australian agriculture. Such figures are regularly cited and provided everybody understands the way the numbers are derived, nobody is mislead. But is the financial cost of a motor vehicle just the sum or your petrol receipts? Of course not. The emissions included in the agriculture sector for official purposes encompass only a part of the emissions incurred during food production. The emissions associated with the production of the steel to build the factories which build the cattle trucks which carry the cattle to market should be allocated to food production but aren’t. Studies like the CSIRO’s 2005 Balancing Act attempt to properly allocate emissions to sectors by following the money along production chains. This study found that meat production alone accounted for 17 percent of Australia’s greenhouse gas emissions. 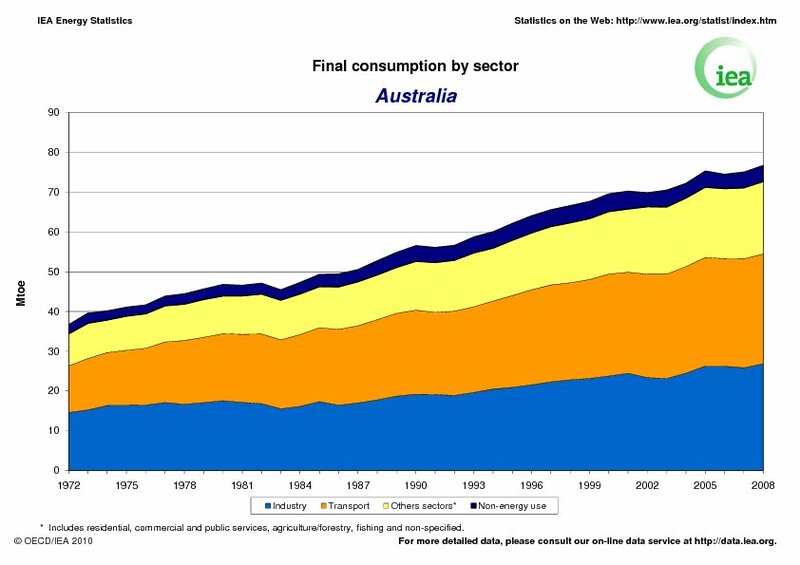 And that still doesn’t include retail and consumer refrigeration, transport and cooking. There is a critical need for analysis of which agricultural emissions can be eliminated with clean electricity and which can’t. For example, methane from cattle and nitrous oxide from agricultural soils won’t be reduced by wind farms or nukes. An interesting and well-written article, Geoff, thanks. Switzerland hasn’t decided yet whether they want to exit nuclear. fields in the mountains. The tourism industry needs picturesce landscapes and indirectly pays the farmers to keep it that way. I guess I can see where the author is coming from. Interesting stuff Geoff. “…. it seems that more efficient buildings have had a down side … people just build them bigger. This means that the space per person which needs heating has gone up.” and “the rise in motor vehicles and their use”. Not really cause-and-effect from efficiency gains I would suggest. What factor of the rise would you attribute to rising affluence instead? The 27″ screen in front of me uses 4% of the 21″ Sony Trinitron that I had once-upon-a-time. I could still have 5 of them and only get to 20% of the energy consumption, not to mention the manufacturing and transport advantages of LCDs. Why would you do that? The metric used by policy makers is g-CO2-e per km so that it can be usefully compared to rail and air transport. No nukes? Come on, Switzerland, pull the other one! They have the export potential of a massive increase in energy demand in Germany to the north and continuing demand from Italy to the south, as well as a public which is used to the presence of nuclear power plants. The idea that the French nuclear industry expand to take over the Swiss energy export markets must be er, galling to conservative Swiss. A few blackouts during winter may mark a turning point in what their respective voting public wants to hear. We may yet have the spectacle of these three countries racing to re-interpret their previous governments’ decisions on nuclear expansion. Note that almost any major legislative decisions made by the Federal Government in Switzerland must be passed by the people. They vote about 4 times a year with perhaps a dozen proposals each time. So the Swiss people are firmly behind greenhouse emission reductions, despite the extra taxes and building regulations. The comparison with Australia couldn’t be more stark. Nearly every single MP elected in Australia last election was from a party that said “no carbon tax”. What is stark is how Switzerland as a nation treats the opinions of it’s people with such reverence and Australia treats the opinions of it’s people with such disdain. in the office, where they used to have 1.
of very high density urban areas. Helmut: Sure, the decision isn’t done and dusted by any means and hopefully sanity will prevail … but the Swiss greens are lobbying hard and not without influence. on beauty. They also pay farmers NOT to fertilise some pastures because this brings more wildflowers … they call them “thin meadows” as opposed to a “fat meadow” fertilised with liberal amounts of cattle manure. Back in 2003, I compared the level of Swiss agricultural subsidies with those in Australia … I don’t remember details but they were comparable … but for very different reasons. Before continuing congratulations to Barry Brook and all the contributors for making this blog exceptional. It is one of my references regarding energy. and the Swiss Senate Energy Committee has changed the anti-nuclear proposal from banning nuclear power to ban nuclear plants “of the current generation”, which, for swiss means GEN II. In my view, and since the older swiss nuclear powerplant is scheduled to be phased out in 2019 that means new GEN III+ and later GEN IV nuclear powerplants will be build in the country. Zvydocha, we’re not claiming that the energy efficiency gains that are possible are small. To the contrary they can be very large. But you’ve got to understand, the USA draws an average primary energy flow of 11000 Watts. That’s 11x1kW hair dryers, running constantly. Sure this can be cut, perhaps as much as 50% with more efficient cars, appliances and factories. But that’s still 5500 Watts. With 10 billion people at that level, that’s 55 trillion Watts, of average primary energy use. Even if we can get another factor of two beyond that, which borders on the thermodynamically possible, we will need to supply 27.5 trillion Watts of average primary energy flow for our future planet. We currently have a primary energy flow around 15 trillion Watts. So that’s an almost doubling of the primary energy demand, with extremely aggressive energy efficiency and lifestyle conservation included!! The conservation and efficiency enthusiasts never calculate this. In stead they dishonestly, or perhaps honestly but naively, compare the savings to the business-as-usual scenario. That’s comparing a bigger energy demand to an even bigger one without being frank about the absolute numbers. Basically we’re looking at big economic and population growth. We can get more efficient, but it won’t reduce the need to produce more energy than we do today. LCDs are ~50% more efficient than a CRT. Look at it another way; a decent 27″ LCD consumes about a 100 watts(E.g. dell U2711). That puts your Sony Trinitron at a terrifying 2.5 kW. A Sony CPD-E500, 21″ trinitron monitor(which I assume is similar to what you mean; since the trinitron brand appears to have been used widely) puts out 145 watts. In summertime, Swiss nuclear power can easily do refueling outages and the country still is a net electricity exporter due to its hydropower ressources. Yet in the the other three seasons, nuclear is running at full tilt and still there are considerable electricity imports (mostly via long term contracts with France). All the while, hydropower output is rather modest as the run-of-river plants are waiting for some melting snow to fill the river and the alpine storage dams must watch out not to freeze themselves. Interesting and well written article thx Geoff Russell. Any idea what that number is for us in the US?? On one hand it seems like it should be at least 25 since the US population is pretty much of an energy pig (just my observation I don’t have the numbers). On the other hand we do get a fairly high percentage of our electric from Nuclear so that would push the number down. Just thought I’d make the point: In Europe people have been calling for the closure of existing plants now operating. I know some people there want to completely shut down the industry but on the other hand there is a concern about ‘older’ reactors in light of the Fukushima incident and whether older designs should continue to operate. I suppose I would want to be more precise and ask: Have they completely ruled out building new nuclear plants or just the extension of existing ones? Bruno: Thanks for the extra subtlety in the Swiss position. Historically they have rejected previous calls to ban nukes, but Fukushima certainly freaked people I spoke to, so it will be interesting to see how things progress. I hope your assessment is correct. transit scheduling … when I first started, timetabling was done with large scrolls of paper about 12 feet long on huge desks built for the purpose … ahhh, those were the days! Swiss are very clever about hiding their dams and NPPs from tourists. I’ve been to Switzerland at least 3 times and never saw one of either. The first picture in this article is perfect. You should use it in any other presentations as a back drop. It gives a great subliminal message!! Sorry, yes, I was somewhat out there. The monitor I was referring to (I found the brochure GDM500 claimed 160W). The one I have now is an Apple Thunderbolt 27″ which is based on a Fujitsu LED panel for a claimed 33W, so ~20%. You are projecting there, I respectfully suggest. Another great essay by Geoff… a *charming* vegan! Of course, you understand, Geoff, that you slight-of-hand, anti-cow attitude doesn’t get past this proud carnivore! No indeed! Yes anti-cow! It’s never, ever, about the beef among our Swiss brethren, as Geoff would have you believe! No! Nor is about the few thousand extra cases of bowel cancer some Swiss will develop for eating *too much* beef. No! It about T H E C H E E S E! This is the whey in the road that our Geoff doesn’t want you to contemplate! Ha! Geoff stands exposed as an ANTI-CHEESE person. For anyone interested in looking up the latest data on per capita emissions and many other related statistics on any country, I think that http://www.co2.org is an excellent resource. It certainly beats the Wikipedia page cited by Geoff Russell in a comment above, having much newer as well as more detailed data. It might even be worth considering adding that to the “Climate and Energy Resources” sidebar of this blog. 2009 data has Switzerland at 6.00 tonnes per capita, somewhat lower than the figure given in the blog post above. Australia gets D for 2008, but A for 2009.
just about anybody on the planet … 315 kg/person/per year in Switzerland Vs 230 kg in Australia … 256 kg in Italy … 250 kg in the US. Hence the calves and the bratwurst. So yes, they don’t eat that much beef … about half the Australian intake, but just over the European average. Which is why beef didn’t get a mention in the body of the article … only in the notes talking about Australian emissions. Am I anti cheese? I’m vegan for many different reasons. Would you like a recipe for “cashew cream”? Much nicer than dairy cream. There are some people making passable vegan cheese these days, but I don’t really eat it because once you stop eating cheese, you quickly lose the taste for it … it just tastes cloying and fatty and you feel “yucky” afterwards for an hour or so. Back when I ate cheese in the early 1980s, we used to have regular fondues (my wife is Swiss! ), but I couldn’t stomach the fat content these days. For the lay person, comparison is everything when attempting to get a handle on a new concept or measure. You do comparison extremely well Geoff. Another great post. Interestingly, while I never been *passionate* about eating cheese, going for weeks without eating it, I go through wonderful splurges of eating it. It’s actually my biggest anti-vegan pet-peeve, Geoff: “The Cheese” which is so wonderful, good for you *eaten in moderation* (the fat often passes through you do to the fermentation that cheese undergoes). Like everything, eating in moderation is the key. If Americans ate beef in moderation for example, the number of cows according to this: http://www.epa.gov/agriculture/ag101/beefbackground.html is around 33 million head. It’s steadily declined over the last 30 years, oddly. Anyway, I think the Swiss will back out of their anti-nuclear fit. The Germans, I’m not so sure about. Siemens announced today they are ending all their nuclear business. The point is if you’re not worried about the environmental risks or health risks associated with cheese consumption or if you think the benefits out weight the risks then you shouldn’t worry about the environmental or health risks associated with nuclear power since the risks are much lower and the benefits much higher. The graph fits with my understanding because the reduction in numbers has been driven by an increase in body size … again FAOstat has the numbers … average carcase has gone up from 240 kg in 1975 to 355 kg in 2009 (leaving total production up just a little despite decrease in herd size). I know of know evidence that moderate quantities of cheese is good for you … only evidence that large amounts are bad for you. Of course we can have the LNT/Hormesis debate again with Cheese in place of Radiation :). My caesium post had a beautiful picture of dairy protein obliterating DNA and the World Cancer Research Fund thinks diets high in calcium are a “probable” cause of prostate cancer … in the west “high in calcium” is generally synonomous with “high in dairy products”. I know I said the picture at the beginning of this article was perfect as a backdrop for any presentation re: the Benefits of Nuclear Power. However, I would just make one more suggestion: Make the fields a light green (photoshop)….. and possibly substitute a containment dome for the cooling towers as the public might confuse the cooling towers w/ emissions from fossil fuel.